In the pre-blog days I read Vreeland's Girl in Hyacinth Blue, about a Vermeer painting, which I enjoyed, though it suffered in comparison with Tracy Chevalier's Girl with a Pearl Earring which was published the same year. This novel brings to life the characters in Renoir's wonderful painting (a link here) which I see when I visit the Phillips Collection in Washington. The painting is set at the Maison Fournaise on the Seine outside Paris where boaters stopped for a nice long lunch. One impetus for Renoir's difficult decision to turn from a steady income for portrait painting to undertaking a large en plein air painting with many figures was Zola's dismissal of the impressionists as failing to reach their potential. Then he had to cope wiith his money problems and the challenge to find amenable models that represented Paris life. Key figures in the painting (listed here in Wikipedia) include Alphonsine, daughter of the owner of the restaurant, leaning on the railing. Her voice and story are prominent. The fellow with the incongruous top hat is Charles Ephrussi, a wealthy supporter of the arts in Paris who was the purchaser of the collection of netsuke in The Hare with Amber Eyes. Another important figure is Gustav Caillebotte, in the foreground on the right; he was a painter, a supporter of the arts, and a particularly close friend of Renoir. The small face looking at the woman drinking from a glass is a mystery figure, perhaps Guy de Maupassant or Renoir himself, added at the last moment. This addition avoided the problem of having 13 figures in a painting deemed unacceptable because it recalled The Last Supper. The author does a great job of creating the idea of a lively and disparate group, all focused on supporting the creation of a wonderful painting. They represented the new modern life in Paris in 1881: young people boating on the Seine on the weekends at the time when the country is recovering from the horrors of the Prussian War (1870 to 71), especially the 4-month siege of Paris and the Commune of Paris in 1871. We learn about the schisms within the impressionist painters’ movement as some painters continued to show at the Salon while others insisted those who did so should not be allowed to participate in the impressionist shows. Caillebotte, who worked to support the movement, was particularly troubled by the divisions within the group. 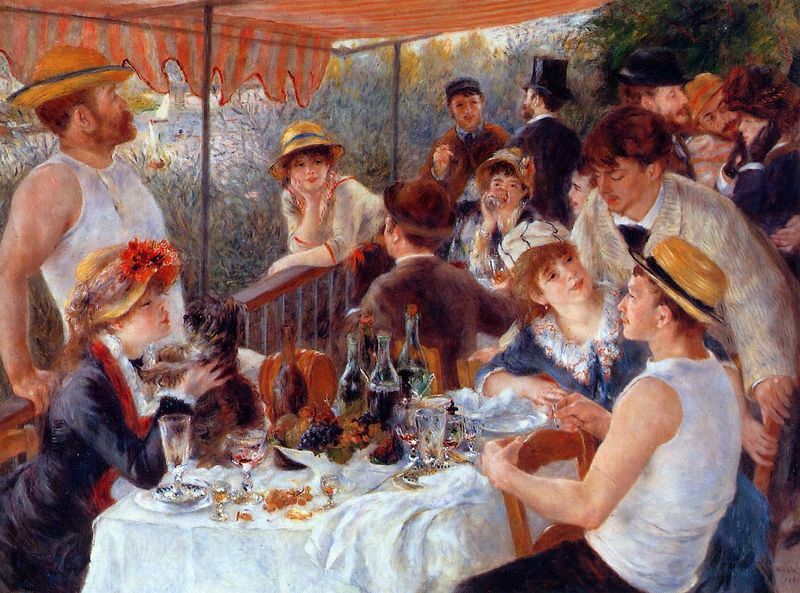 Renoir was pressed to finish the painting before a regatta, an event that was too lucrative for Maison Fournaise to allow the group to spend the afternoon posing on their terrace. Several group members were involved in the boat races and these sporting events were recounted in, for me, excruciating detail. Otherwise I found this book to be a great pleasure to listen to. Susan Vreeland, Luncheon of the Boating Party, Penguin Books, 2007, 448 pages. Available from UVa and the public library, as well as Amazon.